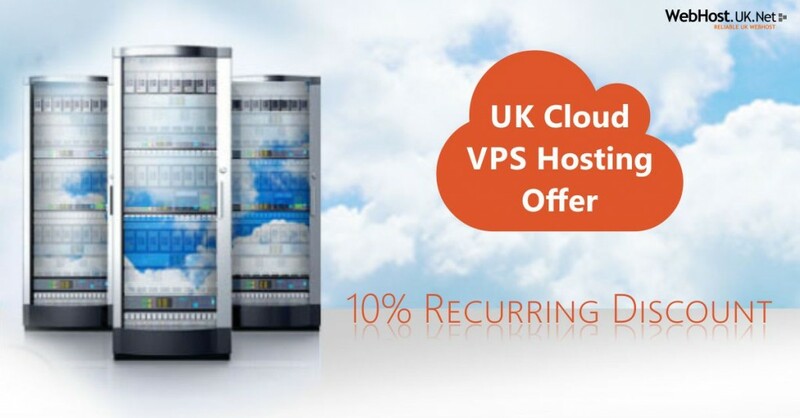 One of the leading and cost effective UK Web Hosting providers, WebHostUK announced 10% Recurring Discount Offer on its Cloud VPS Hosting Plans. WebHostUK offers robust Cloud Servers located in best UK Data Center designed to deliver scalability, flexibility and reliability. To redeem 10% Recurring Discount, use 10CLOUD Coupon Code. WebHostUK Cloud VPS Hosting offers Dedicated CPU resources such as RAM, Processor, Number of Cores and Disk Space easily scalable making it ideal for business websites as it delivers high-performance unlike traditional web hosting and VPS hosting. WebHostUK’s Cloud VPS Hosting are powered by Citrix Xen Cloud Technology which is the pioneer of flexible cloud orchestration platform and comes with Free WHM/cPanel control panel. Customers can also choose their Cloud OS from the extensive list of Linux Operating System available like CentOS, Debian, Ubuntu, Red Hat and many more. So why wait? Order now and take benefit of this offer! If you have any questions, please send an email to sales@webhostuk.co.uk or contact our Sales Department on Live Chat. October 14, 2013, UK Web Hosting provider, WebHostUK announced 10% Discount on the first payment of Cloud VPS Hosting Plans. WebHostUK offers highly scalable, flexible and robust Cloud Servers. With Cloud VPS Hosting, customers get Dedicated CPU resources such as RAM, Processor, Number of Cores and Disk Space which are highly scalable when your website or application demands. Cloud VPS Hosting is ideal choice for business websites as it delivers high-performance unlike traditional web hosting and VPS hosting. WebHostUK’s Cloud VPS are powered by Citrix Xen Cloud Technology which is the pioneer of flexible cloud orchestration platform and comes with Free WHM/cPanel control panel. Customers can also choose their Cloud OS from the extensive list of Linux Operating System available like CentOS, Debian, Ubuntu, Red Hat and many more. To redeem 10% Discount on Cloud VPS Hosting, use 10CLOUD Coupon Code while placing the order. All Cloud VPS are fully managed that includes Pro-Active Server Management, Round The Clock Monitoring, Periodic Security Audits and Software Updates. Our Experienced System Administrators are readily available 24-hours 365 Days for any assistance via Live Chat and Tickets. Hurry Up and Order Now! For any further information or assistance please send an email to sales@webhostuk.co.uk or contact on Live Chat.